Catalysts are the result of chemists seeking to unravel the beauty of molecules and the mystery of chemical reactions. Professor Jeong Young Park, whose research focuses on catalytic chemical reactions, is no exception. His research team recently made breakthroughs in addressing longstanding questions for understanding reaction mechanisms on bimetal catalysts. 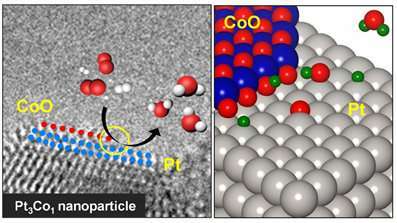 During the studies reported in Science Advances, following publication in Nature Communications this month, Professor Park's research team identified that the formation of metal-oxide interfaces is the key factor responsible for the synergistic catalytic effect in bimetal catalysts. The team confirmed this fundamental reaction mechanism through in situ imaging of reaction conditions. This is the first visualization of bimetal surfaces under reaction conditions, signifying the role of metal-oxide interfaces in heterogeneous catalysis. Recently, research groups have suggested that oxide-metal interfacial sites formed by the surface segregation of bimetallic nanoparticles might be responsible for the increased catalytic performance. However, they failed to present any definitive evidence illustrating the physical nature or the fundamental role of the oxide-metal interfaces leading to the improved performance. These findings illustrate that the enhancement of the catalytic activity on the bimetallic catalyst surface originates from the thermodynamically efficient reaction pathways at the metal-metal oxide interface, which demonstrates a straightforward process for the strong metal-support interaction effect. The formation of these interfacial metal-metal oxide nanostructures increases catalytic activity while providing a thermodynamically efficient reaction pathway by lowering the heat of the reactions on the surface. By estimating the chemicurrent yield, the research team conclude that the catalytic properties of the bimetallic nanoparticles are strongly governed by the oxide-metal interface, which facilitates hot electron transfer. Professor Park explained, "We feel that the precise measurement of hot electrons on catalysts gives insight into the mechanism for heterogeneous catalysis, which can help with the smart design of highly reactive materials. The control of catalytic activity via electronic engineering of catalysts is a promising prospect that may open the door to the new field of combining catalysis with electronics, called 'catalytronics.'" He added that the study also establishes a strategy for improving catalytic activity for catalytic reactions in industrial chemical reactors.